Some days it’s really hard to write. I have 10 hour days at school, and by the time I come home it’s time to clean up, put the baby to bed and maybe breathe before I pick up hubby from his work and collaspe in bed. Friday was nice. I’m doing really well with school. I got to do a couple hair cuts and colors. I love it!!! I wish I had some pictures. Maybe some time I’ll take my camera in and do a couple good photos. I was angry to find out someone had backed into the front of my car. There’s some damage to the bumper. Not exactly what we needed to hear since we are still recovering from the house fire, and everything else that has happened. Last night the family and some friends met us up in Fresno to celebrate my friends birthday. The poor waiter always seemed to walk into our conversation at the wrong moment. Happens often when everyone there has been or is in the Navy. We have a random sense of humor. By the way PFChangs has a complimentary plate of fruit for babies and children! It was amazing. They were so understanding about a baby. We didn’t get home until late and thankfully blue eyes was tuckered out enough that he slept in for us. I was in for a surprise when I woke up though. I walked outside to find one…. two…. three dogs in our backyard. I double checked and sure enough there was an extra dog playing with domino. Come to find out my BIL (brother in law) had taken the pups to the park. A guy had brought the pup in, made sure they played well together and then he took off. My BIL called after him, but the guy yelled back and kept walking. We were able to find out that he has all his shots and he is nine months old. He just needs to be fixed. Well….. we may have a new pup. Or rather my BIL may have a dog. 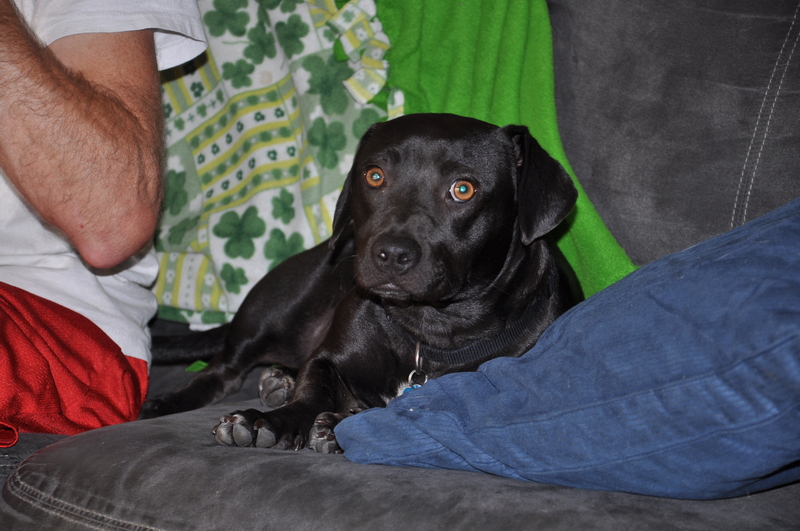 The dog was originally named Jerry (kinda ironic in this family) but we’re thinking he may be renamed to Gamble. So we’d have Blackjack, Domino, and Gamble. Posted in Baby, brother in law, family, hubby, husband, Life Lessons, military, military family, milspouse, mommy, navy, Parenting, pets, photography, wife and tagged abandoned dog, animal rescue, baby boy, brother in law, children, cosmetology, family, house, hubby, husband, kids, life, milhubby, military, military baby, military family, military life, military wife, milspouse, mommy, parents, people, pets, Pets are kids too, photography, school, son, SPCA, spouse, wife. Bookmark the permalink.